It is quite a while ago since I visited Düsseldorf and today I only had that one day to spend there (fly in / fly out) but I managed to get lunch at the Casa Palmieri – and the offer is quite decent. 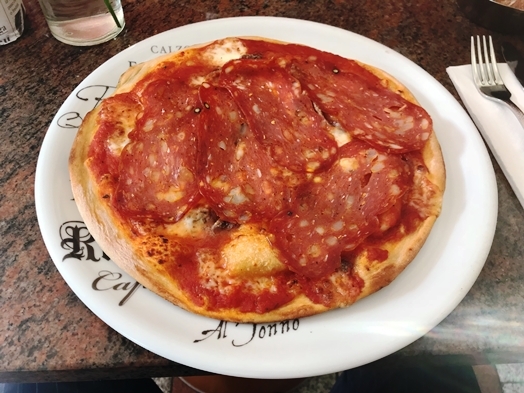 I went for the “Pizza Salsicca (spicy, Italian salami)” (EUR 12.00) which was good in terms of taste (and they added the extra anchovies I had asked for) and it was a decent lunch portion. Usually, pizzas are super huge but they somehow realized that a smaller pizza for lunch is a much better decision. The place is rather simple really and nothing special at all but the service is swift and very friendly and helpful. So, all in all, the Casa Palmieri is a good location for a quick business lunch with a good offering and fair prices.